Is your Christmas tree safe? With the holidays approaching, you’ll probably soon be decorating your home. Read our tips for making your Christmas tree safer to reduce the risk of fire. Here we finally are at the favourite time of year for many young and old: the holidays! During this festive period, here are some important safety rules to remember about Christmas trees. The snow has begun to fall and the holiday season is in the air. Time to put up your Christmas tree! Every year, the question remains: Do I get a natural tree or an artificial tree? For some, the artificial tree is a no-brainer. They’re safer, cleaner, easy to install, and they last a long time. There are therefore many advantages to going with an artificial tree. Artificial trees are also good if you have animals or small children at home. Did you know that water containing chemicals at the bottom of your tree can be harmful to your children and pets? Plus, your little ones wanting to touch everything in sight can end up with needles in their hands and mouth if you choose a natural tree. For others, Christmas without a real tree just isn’t the same! They’ll tell you it’s a tradition and that it smells great in the house. If you choose a natural tree, though, you should know there’s a greater risk of fire. This danger can be reduced by following some basic safety rules. If you’re getting a natural tree, which one should you choose? 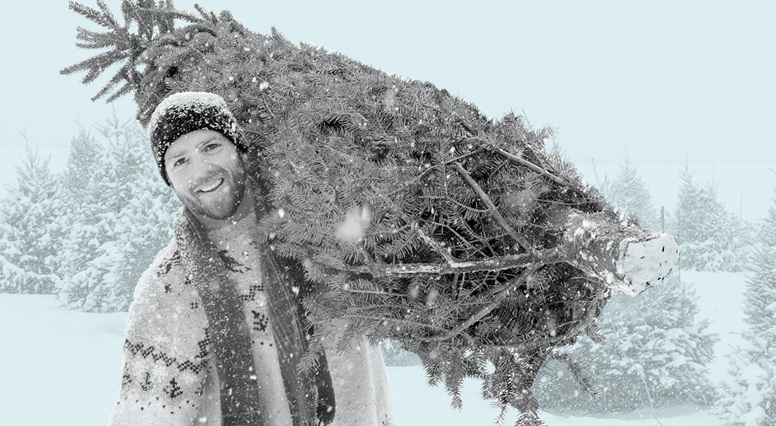 When you go to pick your tree, choose one that’s freshly cut. Make sure the needles are nice and green and that they don’t easily fall off. That way you’ll know your tree is still fresh and not drying out. Cutting the trunk at an angle will help the tree absorb water more easily, which will keep it fresh longer. Then, install your tree in a stand with a basin containing at least four litres of water. By filling the basin every day and making sure it never goes dry, your tree will stay fresh longer and be much less likely to catch on fire. Warning: If your tree is too dry, just turning on the lights could start a fire. So, when it comes to your natural tree, safety is all about freshness. Once your tree is up, keep in mind that as soon as it starts to dry out it will have to go. In general, if your tree stays as fresh as possible, it can last you up to two weeks. However, if it dries out sooner, you unfortunately will have to put it out for recycling or dispose of it in accordance with your city’s rules. Whether you choose a natural or artificial tree, it’s important to be careful with your lights. It is recommended that you choose lights that are CSA certified by the Canadian Standards Association. Also, keep interior lights inside and exterior lights outside. This will definitely save you trouble. Our last tip, but not the least, is to always turn off the lights on your tree when you leave the house and when you’re going to sleep. That way, if an electric spark or the heat from the lights does catch your tree and house on fire, you’ll be able to react right away. You can also get a timer that will turn your lights on and off automatically at specific times of the day. These timers are available in most department stores. In the end, there is no right or wrong between natural and artificial trees. There is only the best choice for you and your family accompanied by safe practices to follow. No matter which one you choose, keep these simple safety rules in mind so you can fully enjoy the holiday season!